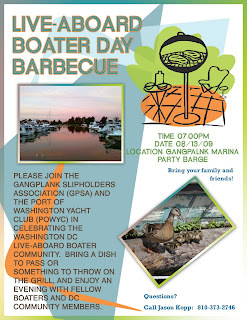 Remember that this Thursday, August 13, 2009 we will be celebrating Live-Aboard Boater Day at the Gangplank Marina Event Barge with a community potluck barbecue. The festivities will begin at 7:00pm. Hopefully we will see you there. Please see the flier below for additional information.